The swelling effect of high-pressure carbon dioxide (CO2) in coal seam is obvious. In the restrained deep formation, it is converted to stress acting on the wellbore and the caprock. The action stress is concentrated near the wellbore and poses a threat to the cement-formation interface. Due to interface failure to micro-annulus, wellbore integrity will be lost and this will have an impact on carbon dioxide-enhanced coalbed methane recovery (CO2-ECBM) and storage. In this paper, the pseudo-steady pressure distribution and steady pressure distribution of CO2 injection process were established after considering the change in permeability of coal seam injected with high-pressure supercritical CO2, and the vertical stress distribution model was derived. A one-dimensional radial numerical simulation formed by iterative method was established. A model for calculating the failure length at the cement-formation interface is obtained, and the shear stress and debonding length at the interface at various injection rates and times are calculated. The results show that the shear stress on the cement-formation interface has the maximum magnitude on the height of the interface between coal seam and caprock. The shear stress generated by coal swelling may break the fragile cement-formation interface into a narrow debonding interface. The injection rate has an influence on the interface failure length. For the same total injection amount, low injection rate is beneficial to protect the cement-formation interface integrity. This study provides a reference for the design of maximum injection speed for CO2-ECBM and storage to avoid leakage. Fossil fuels such as coal, oil and natural gas provide above 80% primary energy of the world. However, the carbon dioxide emissions from fossil fuels represent about 60% greenhouse effect (Wang et al. 2018; Fang et al. 2017). One effective technology to reduce and utilize the emitted CO2 is to inject it into the unmineable coal seam and increase methane production, or CO2-ECBM in addition to CO2 storage/sequestration (Zhang et al. 2015; Ibrahim and Hisham 2015). This technology can improve the recovery of coalbed methane, realize the geological storage of CO2, and achieve the purpose of easing greenhouse gas emissions. This method depends on the higher CO2 adsorption/sorption capacity than CH4 and most other adsorbing gases underground of coal seam and utilizes the injecting CO2 from the ground to the bottom hole to replace the adsorbed CH4 to free state (Haszeldine 2009; Mackay 2013). The injection of gas increases the pore fracture pressure and drives the free gas flowing out of the CBM production well, and thus increases the production and recovery of CH4 (Mitra et al. 2008; Shi et al. 2014). The technology of CO2 injection into deep formation was widely used all over the world as a purpose of enhanced oil recovery (CO2-EOR), natural gas recovery (CO2-EGR) and CO2 storage (Bryant 2007; Yang et al. 2014). 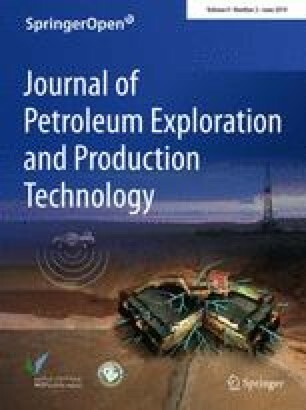 It has been proved that injecting CO2 into coal seams was a promising technique for improving coalbed methane recovery (Keim 2018; Cui et al. 2007; Kubus 2010). The first CO2-ECBM pilot test was carried out in San Juan Basin of Colorado and Meridian in 1993 and 1995 (Gunter et al. 1997). A large-scale CO2-ECBM field was performed in Allison Unit in San Juan Basin during 1995–2001 (Reeves et al. 2003). Since then, more than a dozen ECBM field trials have been orchestrated in reservoirs around the world (Pan et al. 2017), such as Western Canada Sedimentary Basin in Canada from 1998 (Mavor et al. 2004), three field projects in Qinshui Basin and one at the eastern margin of Ordos Basin in China from 2004 (Qin et al. 2017), Upper Silesian Coal Basin in Poland from 2004 (Van Bergen et al. 2009), Ishikari Coal Basin in Japan from 2004 (Yamaguchi et al. 2006) and Illinois Basin in USA from 2008 (Oudinot et al. 2011). There is a significant difference in the formation medium between ECBM and other CO2-enhanced recovery or storage technology. That is, coal seam swells/shrinks after absorbing gases, the adsorption of gas in the pores of coal results in the decrease in the free energy of coal surface, thus causing the swelling of coal (Pan and Connell 2007; Sakurovs et al. 2008). The swelling is much larger adsorbing CO2 than that adsorbing CH4, and the swelling effect becomes especially obvious under high-pressure condition (Vishal et al. 2013; Zhou et al. 2011). Shi and Durucan (2004) modified the standard geomechanical description by using the method of sorption-induced coal swelling strain. The resultant geomechanical relationships were used with the permeability models and developed permeability models that integrate strain and pressure effects. Cui and Bustin (2005) assuming that there is a linear relationship between porosity and strain difference, showed how this derivation should also include the effect of coal swelling, assumed that bulk and pore swelling strains were equal. Pan and Connell (2007) presented a theoretical model based on adsorption thermodynamics and elasticity theory; this model describes gas adsorption-induced swelling by assuming that the surface energy changes and it can describe coal swelling in different gases based on one set of coal property parameters and adsorption isotherms for different gases. Jikich et al. (2009) observed the internal structural changes of coal adsorbing various amount of CO2 by X-ray computed tomography. Connell et al. (2010) derived from the general linear poroelastic constitutive law, presented analytical permeability models for tri-axial strain and stress conditions which distinguish between the sorption strain of the coal matrix, the pores (or cleats) and the bulk coal. Lu and Connell (2010) developed a predict model to describe the change of porosity, permeability and swelling strain of coal with CO2 absorbed under at most 12.8 MPa and applied to the results from a series of laboratory tests. Pan and Connell (Pan and Connell 2011) presented a more general stress–strain relationship for anisotropic conditions. Directional swelling strain is considered as if it will have the same impact as thermal expansion in each direction. It is considered that the effect of directional expansion strain in all directions is the same as that of thermal expansion. Qu et al. (Qu et al. 2012) studied a permeability switching model to represent the evolution of coal permeability induced by CO2 absorption under variable temperatures, and the result was consistent with typical laboratory and in situ observations available in the literature. Day et al. (Day et al. 2012) studied the swelling of CO2 in the unconstrained coal seam at 55 °C and 15 MPa conditions by experiment. The swelling of coal seam sample is about 1-3% after CO2 is completely absorbed. Harpalani et al. (2016) carried out a laboratory study and measured the permeability and volumetric strain of the coal caused by the swelling of absorbed CO2 under the pressure among 2.41 MPa (350 psi) and 5.86 MPa (850 psi). There are many leakage pathways in the process of CO2 injection and storage. 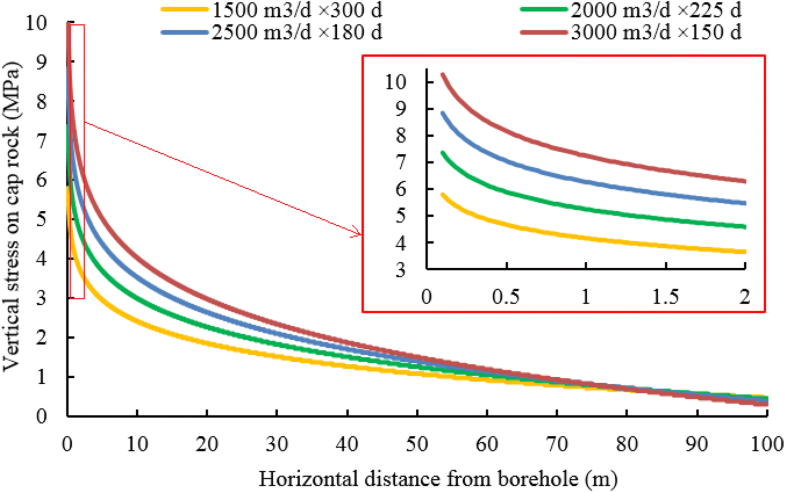 The leakage paths of geological factors include top and bottom cap fractures, formation faults, while borehole factors include cement and casing of the injection and abandoned wells (Guen et al. 2009). Huo and Gong (2010) simulated the CO2 leakage rate from formation fracture and compared the rate of fractures in CO2 injection formation versus in caprocks by using discrete fracture model. Papanastasiou et al. (2016) presented a leakage pathway induced by fracture slip based on the modeling work of hydraulic fracturing in weak formations. CO2 can migrate upwards through non-sealing faults or through induced hydraulic fracturing if the CO2 pressure exceeds the closure stress defined by the minimum in situ stress. One of the main risks identified with storing CO2 in the subsurface is the potential for leakage through existing wells penetrating the caprock (Nygaard et al. 2014). Tao et al. (2014) developed a prediction model of CO2 leakage rate along wellbore based on sustained casing pressure data. Loizzo et al. (2011) studied four leakage pathway classes of wellbore including mud channels, chimneys, micro-annuli and no cement, and quantified the risk of leakage. Haghighat et al. (2013) studied the CO2 leakage rate from geologic and wellbore pathways prediction model based on big data and smart field technology. However, the study of coalbed wellbore integrity induced by swelling of CO2 adsorption was rarely reported. In fact, the swelling effect cannot be neglected. It is converted into internal stress under the stress constraint at deep coal seam condition. The calculated constraining stress was about 25 MPa based on the swelling parameters of Day’s et al. (2012) measurement. The stress generated by high-pressure CO2 swelling is concentrated near the wellbore which threatens the wellbore integrity. The cement between the casing and coal seam was formed by cement slurry that was injected from the well and coagulated under the condition of underground. The cement-formation interface is relatively weak (Ai et al. 2014) and is one of the potential leakage pathways for CO2 injection and geological storage. However, the high-pressure injection swelling effect near wellbore increases the stress on the cement-formation interface. When the stress breaks the fragile interface and debonds, CO2 will escape from coal seam and cause safety problems. The CO2 field injection time is short and there is no comprehensive monitoring system for CO2 leakage (Li et al. 2016), so few cases of CO2 leakage have been reported. In addition, the whereabouts of injected CO2 cannot be fully informed, even injected CO2 leaks from the wellbore of adjacent formations, the current technical means are difficult to know. As a result, there are very few data reports of CO2 from the industry. The present study of geological integrity does not consider the cement-formation interface influenced by the effect of coal swelling which produce great stress under the consideration of high-pressure supercritical CO2. In this study, considering the pore pressure distribution after CO2 injection, combined with the swelling effect of supercritical CO2 in the coal seam, the stress distribution and the shear stress value at the cement-formation interface of the caprock are obtained. The failure condition and debonding failure length of cement-formation interface were calculated. Adsorption is a physiochemical process, describing the adhesion of particles of a phase at the surface of another phase. Adsorbates are fluid, and adsorbents are generally a porous solid (Mukherjee and Misra 2018). As the gas molecules are adsorbed, the molar entropy of the system and the enthalpy between adsorbed phase and adsorbents both decreases. Coal swells during gas adsorption and shrinks during gas desorption. This sorption-induced coal matrix volume change is a unique phenomenon for coal reservoirs. Laboratory measurements have shown coal can swell up to a few percent volumetrically (Pan and Connell 2012). Methane exists in coal seams mainly in two different states, adsorbed phase and bulk gas phase, with a small portion of methane dissolved in formation water. The adsorbed phase of CBM usually accounts for more than 80% of the total gas in place content in subsurface coal seams (Wang and Tang 2018). Gas adsorption behavior in different adsorbents depends on thermodynamic properties of gas and adsorbent interaction (Vishal et al. 2013). The affinity of CO2 in coal is higher than methane, and the amount of CO2 adsorbed in coal is always higher than methane at the same pressure (Tang and Ripepi 2017). For a system containing CO2 and CH4, differential strain develops due to excess strain caused by dissolution of CO2 in coal compared to that of CH4, on unit concentration basis. where p(r) is the pore pressure at location r (Pa), pi is the initial pore pressure (Pa), qc is the CO2 injection rate (m3/s), μc is the CO2 viscosity (Pa s), Ct is coalbed comprehensive compressibility (1/Pa), Ks is the permeability of coal seam (m2), hs is the seam thickness (m), t is the injection time (s), and r is the distance from borehole (m). where pin is the bottom hole injection pressure (Pa), rw is the wellbore radius (m), and re is the equivalent supply radius (m) which can be converted according to the single well control area of the production well. where Ksi is the original permeability of coal seam (m2), Es is the Young’s modulus of coal seam (Pa), Cp is the coal particle compressibility (1/Pa), pc is the average pore pressure (Pa), υ is the Poison’s ratio of coal seam, and εf is the free swelling strain of coal under unconstrained condition. where A is the area of the single well control area of the production well (m2). In the process of ECBM or geological storage by injecting CO2 coal seam though perforation tunnels from injection well, the injected CO2 swells the coal seam. As is known to all, only the unmineable coal seam may conduct the ECBM or CO2 geological storage. Whatever, the coal seam that meets the above condition is always being bounded by the higher burial depth of the strata, which gives rise to almost no space for formation swelling and then the swelling produced by the adsorption of CO2 on coal seams is limited. As a result, this part of the original swell amount is converted into stress and stored in the coal reservoir. Thus, the internal coal stress increases. At the same time, the added stress acts upon the injection wellbore, and on the top and bottom coal cover layers as well. The inner stress is caused by swelling effect as radial extrusion stress to the injection wellbore and a longitudinal compressive stress to the caprock. In the action of these two stresses above, it makes a great shear stress on the cement-formation interface which may be destroyed under certain conditions, and the CO2 escape channels are formed (Fig. 1). This can result in some unexpected situations, such as the cross-flow layers of CO2-ECBM, CO2 escape after storage. In general, the formation temperature is about 60 °C in terms of the deep coal seams for CO2-ECBM and geological storage, which is above the CO2 critical temperature of 31.04 °C. The drilling fluid temperature is low during the formation of wellbore. When the wellbore is formed, the surrounding rock was cooled by drilling fluid while the drilling fluid is warmed by whole formation. Compared with the initial state of the surrounding rock, the temperature difference when injecting CO2 is small, and the degree of temperature reduction and contraction of CO2 injection are significantly smaller than the expansion. In addition, considering that the study of temperature calculation brings great difficulties, the influence of temperature change is neglected. where εf(i) is the strain of coal adsorbed on i type single component gas, ϕ is the coalbed porosity, ρs is the density of the coal seam (kg/m3), VL(i) is the Langmuir volume of i type single component gas (m3/kg), R is the gas constant (J/mol/K), T is the coal seam absolute temperature (K) and b(i) is the adsorption coefficient of i type single component gas (1/Pa), and b(i) = 1/pL where pL is the Langmuir pressure of i type single component gas (Pa). 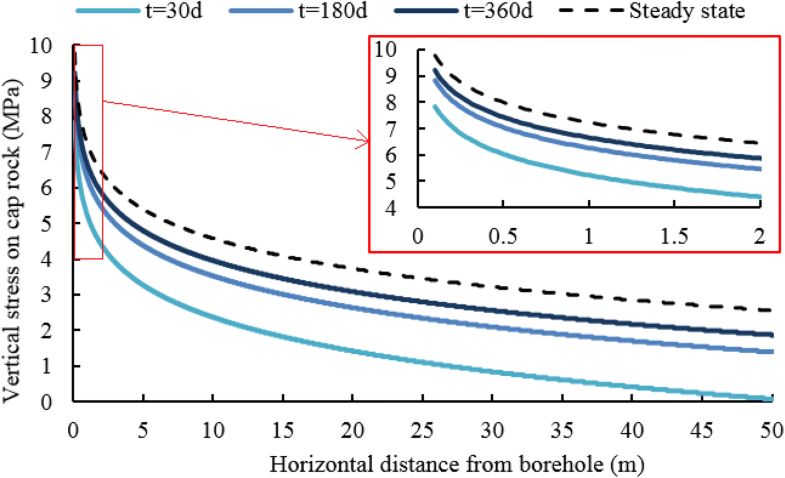 The swelling of the coal seam causes compression to the surrounding rock and the wellbore, so the pressure stress and length reduced strain are taken as positive value in this paper. where εr, εθ and εz are radial strain, circumferential strain and vertical strain, respectively, and σr, σθ and σz are radial stress, circumferential stress and vertical stress (Pa), respectively. The coal seam swells after CO2 injected, but the cement sheath, casing and coal caprock do not. The radial stress generated by the expansion of the coal seam acts on the cement, so that the casing and cement are fixed, and the vertical stress is formed at the interface between the seam and cap. 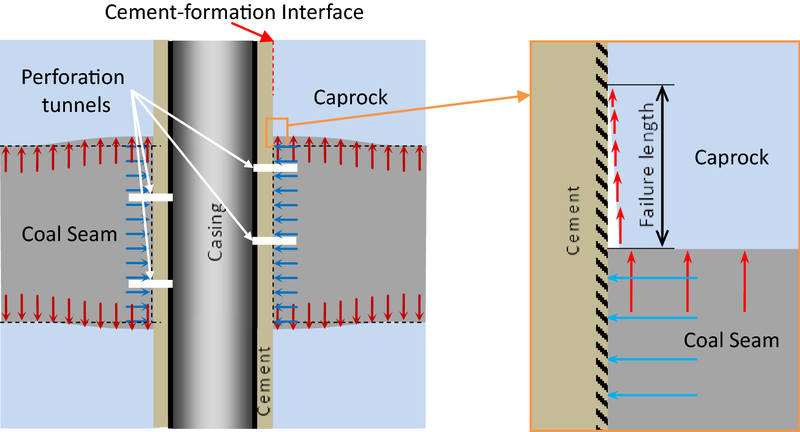 Therefore, on the cement-caprock interface, the cement is fixed by the radial stress and the cap is subjected by the longitudinal stress, which causes the coal swelling effect acting as the shear stress on the cement-formation interface. When τ(z) > sc, where τ(z) is the shear stress on the cement-formation interface (Pa) and sc is the shear strength of cement-formation interface (Pa), the interface debonds. Since the pore stress in the caprock is equivalent to that of the coal seam, the effect of the pore pressure variation on the effective stress can be ignored. when the radius is a and the uniform stress is q.
where r(q) is the inverse function of pseudo-steady or steady state pressure distribution and z is the vertical distance from coal seam. The shear stress decreases with the increase in the distance to the coal seam. 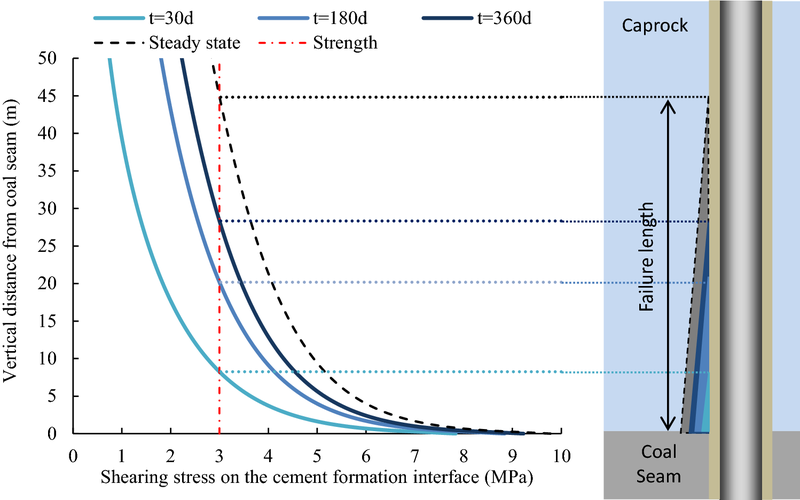 When the shear stress equals to sc, the corresponding z is the cement-formation debonding failure length. The shearing stress on cement-formation interface depends on the stress and pore pressure of wellbore surrounding rock which are coupling effect on permeability, pore pressure and coalbed stress. A one-dimensional radial numerical simulation formed by iterative method and established by a Visual Basic program. Assuming a reasonable value for εf and pc, the Ks can be calculated according to (4), and then calculate p(r) of pseudo-steady state or steady state by (1) or (3), respectively. Then, the pc can be calculated according to (5) and replace the pc assumed first. Iterate pc until the accuracy is satisfied. εf is calculated according to (7) and replaced by εf and returned to the beginning. The calculation is recalculated until the accuracy is satisfied. Finally, the shear stress can be calculated according to Eqs. (10) and (11). The parameters refer to the parameters of the coal seam in Niu’s thesis (Niu 2016) as shown in Table 1.
in which pressure value ranged from 5 to 15 MPa with a correlation coefficient of 0.99 by using the SI unit. In combination with the above parameters and the calculation method in this paper, the corresponding computer program is compiled. The vertical stress distribution, shear stress distribution and the two interfacial debonding failure lengths of the coal seam after supercritical CO2 swelling are calculated. when r2μsCt/4Kst < 0.01. The integral of Eq. (6) used the cumulative method, and the step was 0.01 MPa. The inverse pressure function of Eq. (11) was calculated according to the pressure distribution, and the step was 0.02 m. The integral of Eq. (11) also used the cumulative method, and the step was 0.02 m.
With the injection of CO2, the pore fracture pressure in the coal seam increases. When the coal seam adsorbs CO2, the swelling occurs and the vertical stress is formed. Assuming the injection rate is 2500 m3/day, the vertical stress on caprock was calculated in various injecting times and is shown in Fig. 2. The three solid lines in Fig. 2 represent the vertical stresses formed by coal swelling adsorbed CO2 at various injection times, the dashed line is the stress distribution when the injecting pressure enters the stable stage. Coal seam swells caused by CO2 replace absorbed CH4. The increased pore pressure comes from the injected CO2. For the one-dimensional radial model of single point source, the injection pressure decreases rapidly with increasing distance, as the vertical stress formed by the swelling also decreases rapidly with increasing distance. Under the given calculation parameters, the vertical pressure of coal seam and caprock interface near the wellbore reach 7.8 MPa in 30 days, 9.2 MPa in 360 days and 9.8 MPa in infinite time. With the increase in injection time, CO2 diffuses to the coal seam, the influence scope gradually increased, the vertical stress distribution of stratum is increased overall. Through comparison of 30 days, 180 days and 360 days, the vertical stress increase speed gradually slowed down. However, this stress can only represent the stress magnitude at the cement-formation interface at the boundary between coal and caprock, and the swelling stress is decreased with the distance from the coal seam. For the CO2-ECBM, the pore fracture pressure of the coal seam will eventually become stable, shown as the dashed line in the diagram. Under the condition of CO2 storage, when the injection pressure is close to the formation fracturing pressure, the injection pressure will be controlled under the fracturing pressure in order to protect the formation. Subsequently, the wellbore pressure differential effect is reduced, the formation stress distribution is more average, and the formation becomes safer. Combining the integral method Eq. (11) and assume the cement-formation interface strength is 3 MPa, the results of the drawing above, the shearing stress on the cement-formation interface is shown in Fig. 3. The ordinate in Fig. 3 is the distance from the interface between the seam and the cap, and the abscissa is the shear stress at the cement-formation interface. As the wellbore is under the influence of the lateral pressure caused by the horizontal swelling of the coal seam, it can be considered that the relative injection well does not displace. Therefore, the vertical stress at the cement-formation interface formed in the form of shear stress under the vertical stress at the interface of the coal seam and the caprock. In fact, the shear stress curve is not the shear stress distribution along the cement-formation interface, but rather the curve joined with the shear stress value which if the cement-formation interface debonds to a certain height. When the stress is greater than the cement-formation interface debonding failure strength, the interface will continue to debond. On the contrary, if this stress is less than the strength, the cement-formation interface will not reach at this position. It is considered that the cement-formation interface debonding failure length is exactly the height where the shear stress equals to the strength. Because of the extremely low viscosity of supercritical CO2, it can flow at a narrow debonding interface. The debonding interface becomes the CO2 high-velocity leakage pathway, which influences injection and storage process. As can be seen from Fig. 3, with the increase in CO2 injection time, the vertical stress due to the swelling of coal seam increases, and the shearing stress on the cement-formation interface gradually increases. Taking 3 MPa as the cement-formation interface strength for instance, it can be seen that the failure length of the cement-formation interface will gradually increases, and will reach 45 m when the injection enters steady state. With the same parameters, the injection rate from 1500 to 3000 m3/day and the distribution of the coal swelling stress at the interface between the coal and the cap are calculated under the condition of 180 days. The vertical stress on the coal seam and caprock interface with various injection rates is shown in Fig. 4. The four curves in Fig. 4 represent the stress distributions at the same injection time with various injection rates. With the increase in injection rate, the amount of injected CO2 volume increases. The absorbed CO2 volume increases with coal seam pore pressure and CO2 amount, so the coal swelling effect increases with the increase in injection rate. Hence in constrained underground confining strata, this differential swelling will act as a vertical stress in the caprock. The flow rate increased two times from 1500 to 3000 m3/day, and the stress distribution increased by about 1.3 times. However, it is easy to infer that the faster CO2 injection rate is, the greater the vertical stress formed under the same conditions. Setting the same injection amount of CO2 is 450 × 103 m3, the vertical stress on caprock was calculated with the various injection rates and corresponding injection times as shown in Fig. 5. With the same CO2 injection amount, the time is longer in the low injection rate, so the CO2 in the coal seam is more dispersed, and the radial pressure distribution is more balanced when the coal seam adsorbed CO2. Fast injection causes stress concentration near wellbore and leads to more shear stress on cement-formation. 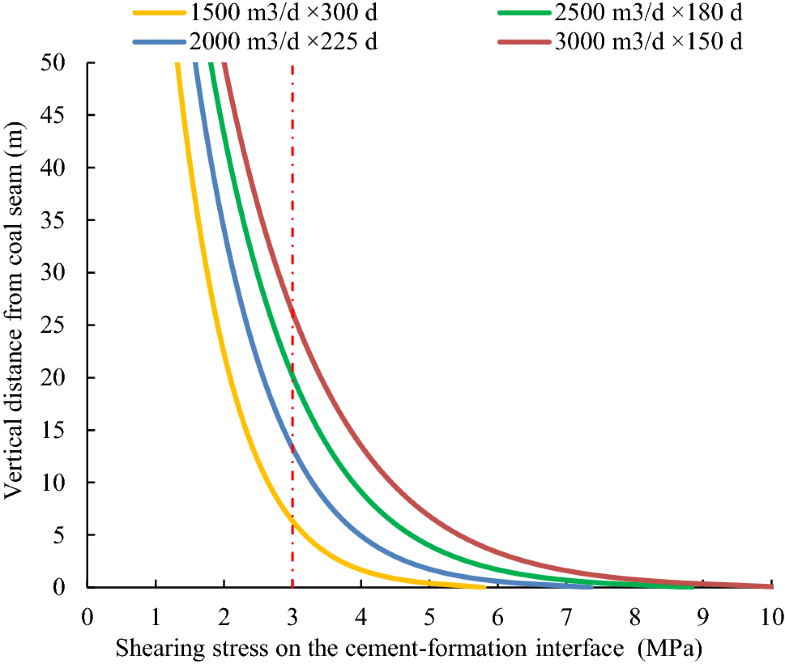 In order to calculate the debonding failure length of the interface, the shearing stress on the cement-formation interface is calculated according to Fig. 6 results. Under the condition of the same CO2 injection amount, the debonding failure length of the cement-formation interface is the shortest with low injection rate although it needs the longest time. 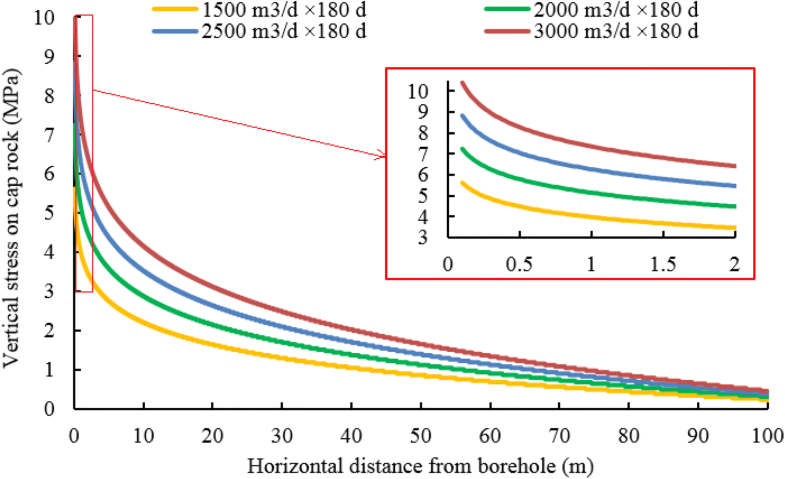 Under the given parameters, the debonding length of the cement-formation interface at 1500 m3/day injection rate is 5.3 m, while the 3000 m3/day injection rate is 26.0 m, increasing 4.9 times. In order to study the relation between the injection rate and the failure length of cement-formation interface, various injection rates were calculated according to the same injection amount of 450 × 103 m3 CO2 with corresponding time. The two curves in Fig. 7 are the cement-formation interface debonding failure length and the corresponding injection time with various injection rates, respectively. For the given parameter, when the injection rate is less than 700 m3/day, the cement-formation interface does not damage, but the injection time is relatively long. 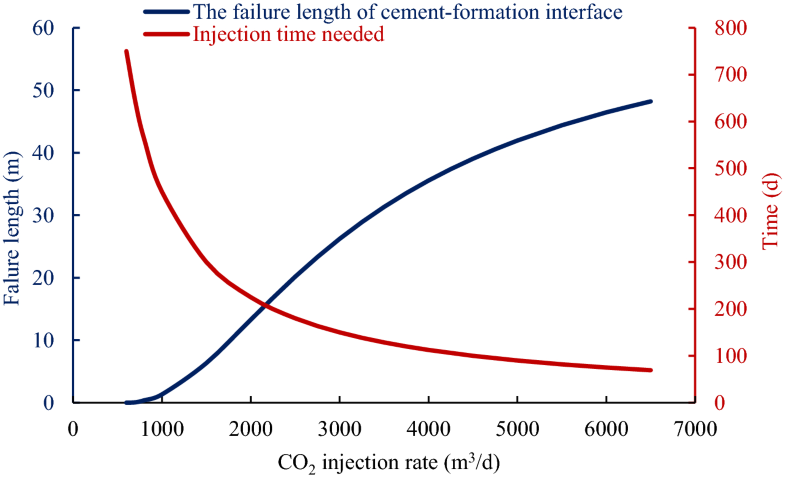 With the increase in CO2 injection rate, the debonding failure length of the cement-formation interface increases rapidly, and the failure length increases and the speed slows down when it reaches more than 4000 m3/day. In order to ensure CO2 cannot escape from injection coal seam, it is suggested that the injection rate should be reasonably designed according to the thickness of caprock. This model considered the coal swelling effect in the process of CO2 injection including the formation pressure and permeability changes, while does not account for some secondary factors. The differential swelling strain buildup in a transversely isotropic medium of coal seam is neglected and the release of vertical stress caused by vertical deformation after coal seam swell is neglected. This paper also does not consider the temperature effect and cannot analyze the effect of temperature reduction caused by the change in CO2 injection rate on coal swelling. Assuming that the coal seam is pure methane and the injected gas is pure CO2, the influence of other gas components is not considered. The difference of permeability after CO2 injection into coal seam is neglected, and the average permeability is used to replace the different permeabilities at different locations. With the injection of CO2, the swelling take place on coal seam and the vertical stress is formed along the interface between coal seam and caprock as the coal restrained at deep stratum condition. In the case of the contribution of wellbore confinement by the coal swelling radial stress, the vertical stress acts in the form of shear stress on the cement-formation interface. The shear stress on the cement-formation interface has the maximum magnitude on the height of the interface between coal seam and caprock. The shear stress generated by coal may break the fragile cement-formation interface into a narrow debonding interface. The debonding interface becomes the CO2 high-velocity leakage pathway, which influences injection and storage process. With the same CO2 injection amount, the lower CO2 injection rate causes more dispersed CO2 in the coal seam and the radial pressure distribution is more balanced when the coal seam adsorbed CO2. There is an appropriate injection rate that does not destroy the cement-formation interface. This work was supported by Natural Science Foundation of China (No. 51774094), National Science and Technology Major Project of China (No. 2016ZX05016-002-003), Youth Foundation of Heilongjiang Province (Grant No. QC2018047) and Youth Science Foundation of Northeast Petroleum University (No. 2018NL-19).